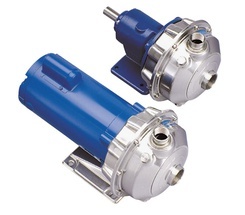 Goulds Pumps Models NPE (close-coupled) and NPE-F (frame mounted) are end suction, single stage centrifugal pumps for general liquid transfer service, booster applications, etc. Liquid-end construction is all AISI Type 316 stainless steel, stamped and welded. Impellers are fully enclosed, non-trimable to intermediate diameters. Casings are fitted with a diffuser for efficiency and for negligible radial shaft loading. Close-coupled units have NEMA 48J or 56J motors with C-face mounting and threaded shaft extension. Framemounted units can be coupled to motors through a spacer coupling, or belt driven.